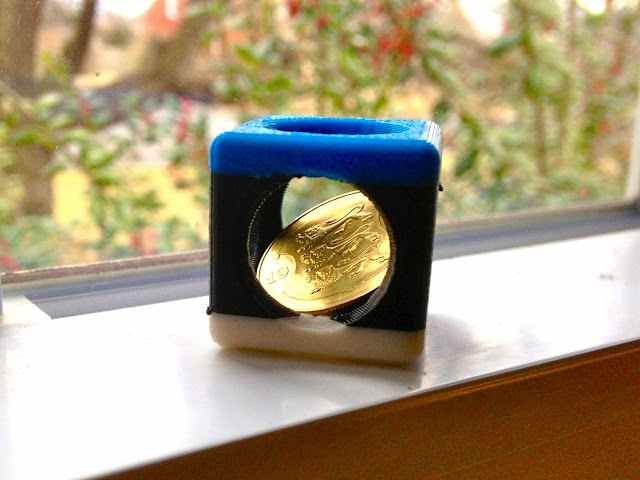 Today's print is a Customized Coin Trap to hold an Estonian Kroon in the blue, black and white colors of the Estonian flag, for my father, who was born in Estonia. Settings: MakerWare .3mm/low in about 15 minutes, with two filament swaps and a pause for the coin to go in. Stuff to change next time: I now wish that I had changed filament a little sooner so that the black stripe would go all the way across the white at the bottom of the circle (and also later to go across the top before the blue). I had been trying to maximize the white and blue parts but keep filament changes away from the center, weaker part of the model.